A view of the jerseys Toulouse will wear at the weekend. 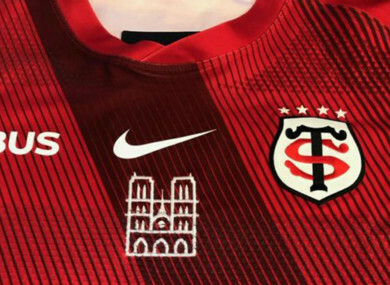 TOULOUSE WILL HAVE the image of the Notre Dame cathedral on their shirts for their Champions Cup semi-final against Leinster this weekend, the French club’s president Didier Lacroix announced on Tuesday. The four-time former European champions are the only French side left in the tournament and face holders Leinster in Dublin on Sunday. Email “Toulouse to pay tribute to Notre Dame against Leinster”. Feedback on “Toulouse to pay tribute to Notre Dame against Leinster”.